Notice that our label has a Name property, we’ll be using that shortly. It also has a Text property for setting the text to be displayed, and then it has Horizontal and Vertical properties for setting where the text should appear. We’ll be coming back to these properties in later posts. Run the application; you should see Welcome to Xamarin.Forms! in the center of your screen. Now we want to add a button. The job of the button will be to change the text of the label. There are a lot of ways to do this, and we’re going to start with a dead simple approach. Later, we’ll see how to use properties and a ViewModel, but one step at a time. First, add the button to the page, immediately below the label. The ButtonClicked method, like all event handlers, returns void and takes two parameters. The first is the “sender” — in this case our Button, the second is of type EventArgs or a class derived from EventArgs. The base class EventArgs, has no properties or methods, it is just a placeholder. In the body of the method we are setting the Text of our label by hand. This is not how we’ll do it in the future, but it does demonstrate that you have access to the label based on its Name property. Run the program again, and you should see Hello Jesse where you previously saw Welcome to Xamarin.Forms. 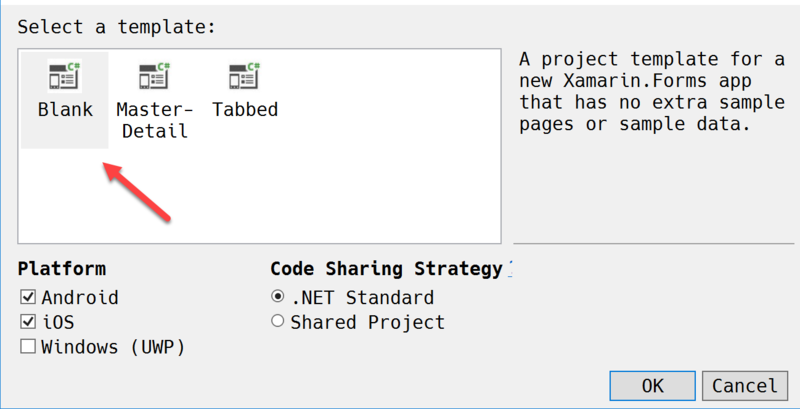 I am just starting to learn Xamarin and find this a nice place to start. I envision starting with a product for Android and windows. I plan to work in IOS later after getting started. Why did you decide to leave out the Windows option in your examples. I plan on including Windows, is something wrong with UWP?